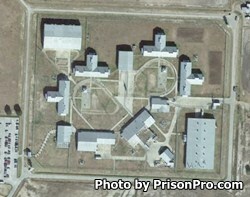 Stevenson Unit is a minimum/medium custody prison located in Cuero Texas. The facility can house up to 1,384 male offenders who range from G1, G2, and G4 custody levels. Stevenson Unit is secured by two razor wire fences and electronic monitoring systems. Inmates are housed in five buildings, some of which are single cells, others contain up to three pods with double bunked cells. One of the units at Stevenson is an open bay dormitory. Stevenson Unit contains an inmate operated modular furniture factory. Offenders can also work in maintenance of the facility. Select inmates provide a supervised labor force to a local food bank, the Habitat for Humanity, local government agencies and the Texas Department of Transportation. Stevenson Unit also operates a facility garden which is tended to by the inmates. Inmates at Stevenson Unit are encouraged to further their education by participating in literacy courses, adult basic education classes and earn their GED. Additionally, offenders can benefit from technical training courses which teach electrical and plumbing trades. Other courses provided by Stevenson Unit include life skills, re-entry preparation, faith based studies, substance abuse education, and access to various support groups such as Alcoholics and Narcotics Anonymous. Inmates incarcerated in Stevenson Unit are allowed visitors on Saturdays and Sundays from 8am to 5pm. Visits are two hours long unless you are granted a special visit from the Warden's office (traveling over 300 miles). Visiting ends promptly at 5pm regardless of what time you entered into visitation, so if you arrive at 4pm you will not have a full two hour visit. Offenders are allowed one visit each weekend. Visitors should bring only acceptable identification, car key, and may bring up to twenty dollars in quarters contained in a small clear Ziploc bag (paper money is prohibited) to utilize in the visiting room vending machines. Always contact the facility prior to your visit to ensure your inmate is still located here and that visitation has not been canceled for any reason.